Well, looks like I figured out how to get Windows Live running on Server 2003/2008/XP64. 4) copy the MSI files to the 2003/2008/xp64 computer and run them. 若採用上述方法將Windows Live 9的Messenger.msi抓出來, 雖然可以安裝, 但執行時會顯示 : 我們無法將您登入Windows Live Messenger的訊息. "Signing into Windows Live Messenger failed because the service is temporarily unavilable. 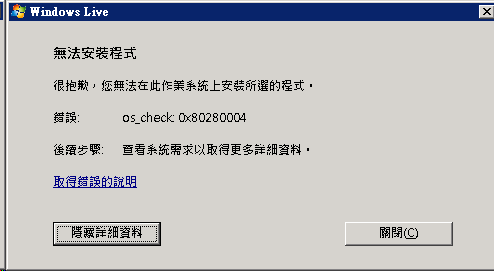 Please try again later"
若採用Windows Live Messenger v8.1的版本, 雖可以安裝, 可以登入, 但執行時會沒有回應. This entry was posted on 2009 年 07 月 29 日 at 18:04:38 and is filed under WLM. You can follow any responses to this entry through the RSS 2.0 feed. You can leave a response, or trackback from your own site.